" 10 Sq. R. A. F. | 1 " 10 Sq. R. F. C. | 1 " 10th Gurkha Rifles (I.A.) | 1 " 11th Lancers (I. A.) | 1 " 12 Sq. R. F. C. | 1 " 12th Cavalry (I.A.) | 1 " 13th Hussars | 1 " 13th Res' Regt. Cavalry | 1 " 14th Lancers | 1 " 16 Sq. R.A.F. | 1 " 2 FTS RAF | 1 " 2 Sq. R. F. C. | 1 " 20th Hussars | 2 " 211 Sq. R. A. F. | 1 " 21st Lancers | 1 " 24th Punjabis (I.A.) | 1 " 27th Punjabis Inf. (I. A.) | 1 " 28th Light Cavalry (I.A.) | 1 " 33rd Punjabis (I.A.) | 1 " 39th Garhwal Rifles (I.A.) | 1 " 40 Sq. R. F. C. | 1 " 41 Sq. R. F. C. | 1 " 43 Erinpura Regt. (I.A.) | 1 " 47th Sikhs (I.A.) | 1 " 49 Sq. R. A. F. | 1 " 4th Gurkhas (I.A.) | 1 " 53rd Sikhs (I.A.) | 1 " 59 Sq. R. F. C. | 1 " 5th Lancers | 1 " 60 Sq. R. F. C. | 1 " 62 Sq. R. A. F. | 1 " 66 Sq. R. F. C. | 1 " 67th Punjabis (I.A.) | 1 " 70 Sq. R. F. C. | 1 " 82nd Punjabis (I.A.) | 1 " 83 Sq. R. A. F. | 1 " 84th Punjabis (I.A.) | 1 " Army Service Corps | 7 " Australian Imp. Inf. | 1 " Australian Infantry | 3 " Ayrshire Yeomanry | 1 " Bedfordshire Regt. | 4 " Black Watch | 2 " Border Regt. | 4 " Cameron Highlanders | 1 " Canadian Inf. | 11 " Canadian Trench Mortar Battery | 1 " Chaplains Dept. | 1 " Cheshire Regt. | 4 " Church Army Huts | 1 " Coldstream Guards | 1 " Connaught Rangers | 1 " Devon Regt. | 2 " Dorset Yeomanry | 1 " Dragoon Guards | 1 " Duke of Cornwall's Light Inf. | 4 " Durham Light Inf. | 4 " East Kent Regt. (The Buffs) | 11 East Kent Yeomanry | 1 " East Lancashire Regt. | 3 " East Surrey Regt. | 3 " East Yorkshire Regt. | 9 " Essex Regt. | 4 " Essex Yeomanry | 1 " Gloucestershire Regt. | 4 " Gordon Highlanders | 3 " Grenadier Guards | 1 " H. M. S. Aboukir | 1 " H. M. S. Argus | 1 " H. M. S. Good Hope | 1 " H. M. S. Phoebe | 1 " H. M. S. President | 1 " H. M. S. Topaze | 1 " H. M. S. Viknor | 1 " Hampshire Regt. | 4 " Hampshire Regt. / RFC | 1 " Herefordshire Regt. | 3 " Highland Light Infantry | 3 " Honourable Artillery Company | 2 " I. A. att Welch Regt. | 1 " Indian Army | 3 " Indian Medical Service | 1 " Irish Guards | 1 " Irish Horse & R. F. C. | 1 " King Edward's Horse | 2 " Kings African Rifles | 1 " Kings Own Scottish Borderers | 1 " Kings Own Yorkshire Light Infantry | 3 " Kings Royal Rifle Corps. | 7 " Lancashire Fusiliers | 7 " Leicestershire Regt. | 6 " Life Guards | 1 " Lincolnshire Regt. | 2 " Liverpool Regt. | 6 " London Regt. | 2 " London Scottish Regt. | 2 " Machine Gun Corps | 2 " Manchester Regt. | 2 " Middlesex Regt. | 8 " New Zealand Inf. | 1 " North Lancashire Regt. | 5 " Northamptonshire Regt. | 4 " Northumberland Fus. | 7 " Notts' Yeomanry / RFC | 1 " O. T. C. | 1 " Ox & Bucks Light Inf. | 3 " Punjabis (I.A.) | 1 " Queen's Own Oxford Hussars | 1 " Queen's Westminster Rifles | 1 " Recruiting Officer | 1 " Rifle Brigade | 2 " Royal Air Force | 5 " Royal Army Medical Corps | 1 " Royal Berks' Regt. | 1 " Royal Dublin Fusiliers | 3 " Royal Engineers | 13 " Royal Engineers and Sq Cmdr RFC | 1 " Royal Field Artillery | 26 " Royal Field Artillery / R. F. C. | 1 " Royal Flying Corps | 5 " Royal Fusiliers | 11 " Royal Garrison Artillery | 15 " Royal Horse Artillery | 2 " Royal Inniskilling Fusiliers | 2 " Royal Irish Fusiliers | 1 " Royal Irish Regt. | 2 " Royal Irish Rifles | 1 " Royal Lancaster Regt. | 7 " Royal Marines Light Infantry | 2 " Royal Munster Fusiliers | 1 " Royal Naval Air Service | 1 " Royal Naval Air Service Manston | 1 " Royal Naval Volunteer Reserve | 3 " Royal Scots | 5 " Royal Scots Fusiliers | 1 " Royal Sussex Regt. | 2 " Royal Warwickshire Regt. | 6 " Royal Warwickshire Regt. Att Lan Regt | 1 " Royal Welch Fus. | 6 " Royal West Kent Regt. | 5 " Royal West Surrey Regt. | 3 " Scottish Rifles | 2 " Seaforth Highlanders | 5 " Sherwood Foresters | 5 " Shropshire Light Inf. | 5 " Somerset Light Inf. | 6 " Somerset Yeomanry | 1 " South African Horse | 1 " South African Inf. | 1 " South Staffordshire Regt. | 8 " South Wales Borderers | 4 " Suffolk Regt. | 2 " The Queens Regt. | 1 " Warwickshire Yeomanry | 1 " Welch Fusiliers | 1 " Welch Regt. | 6 " Welsh Guards | 1 " West Kent Regt. | 2 " West Riding Regt. | 5 " West Yorkshire Regt. | 5 " Wiltshire Regt. | 4 " Worcester Yeomanry | 1 " Worcestershire Regt. | 12 " York and Lancaster Regt. | 2 " Yorkshire Regt. | 4 "
House: No 6, 1909 - 1913. Regiment: East Kent Regt. (The Buffs). Died: 10 October 1915 aged 21 in Belgium. Died of wounds at Poperinghe. Born: 14th November 1894, Dene Wood, 33 Daleham Gardens, Hampstead. Father Managing director of a Public Company. Son of Colonel A. S. Barham and Annie Gertrude Barham formerly Edwards, Hole Park, Rolvenden, Kent. Middle IV A�Matriculation Class. House Prefect. Shooting VIII 1912,13. Went to Clare College, Cambridge. Lived at 5 Green Street, Cambridge. Applied for Commission in May 1914 in 3rd Btn, East Kents (The Buffs). Attached to 1st Bn, The Buffs. 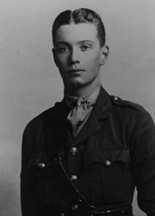 'During November 1914 he was transferred to the 1st Batt. In France, and was subsequently promoted Captain, His Colonel writing of him says: "He is the greatest loss to his regiment. He was only a boy, and yet he possessed the reliance and assurance of men twice his age. When I decided to place him in command of his Company with subalterns under him ten or even fifteen years older than he, I was much impressed by the way in which he came to the fore and accepted his responsibilities. He commanded his Company in a way that proved that he was a commander of exceptional merit. He was thoroughly reliable and dependable in every respect, and full of sound common sense. He was always cheerful, and did his best to impart his high spirit to those under him." 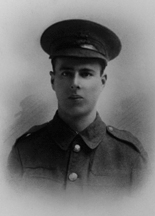 He died of wounds in France on October 10th, aged 21.' (Malvernian, Nov 1915). The Wilfred Barham Exhibition was founded in his memory. House: No 3, 1903 - 1907. Regiment: East Kent Regt. (The Buffs). Died: 03 July 1916 aged 27 in France. Killed in action near Albert. Born 27th October 1889 at 2 Church Road, Ashford. Son of Henry James Bracher (Solicitor) and Marian Alexandra Bracher formerly Neale, of Church House, West Malling, Kent, and of Clock House, Lunton, Kent, and 33 Earl Street, Maidstone. Upper IV B�Matriculation Class. House XI Cricket. Corporal of D Coy, 19th Batt, Royal Fusiliers from 2nd Sept 1914 to 15th May 1915. 6th Bn. The Buffs (East Kent Regiment). 'Guy Bracher will always be remembered here for his splendid vitality: he was thoroughly keen and took a wholly unselfish interest in all that concerned the school. In his subsequent career he showed the same perseverance and activity. He received a commission in the Buffs (East Kent Regiment), and was killed in action.' (Malvernian, Jul 1916). House: Sch, 1903 - 1907. Regiment: East Kent Regt. (The Buffs). Died: 28 March 1918 aged 29 in France. Killed in action. Born: June 9th 1889, 117 Piccadilly. Son of H. E. Hoare, Bix, Henley-on-Thames. Farmer in British East Africa. Great War, 2nd Lieutenant King's African Rifles; invalided; Private A.S.C. ; 2nd Lieutenant 6th Bn. The Buffs (East Kent Regiment). 'He was in East Africa when the war broke out. After getting a commission and serving there, he was invalided out, came home in 1916, and, after several rejections on account of health, obtained a commission in the Buffs, and went to the front on December 30th of last year. He was killed in action March 27th. Evelyn Hoare never made much mark at School, but showed some determination and independence. He had a strong sense of humour, and was a pleasant companion, but took an unusually long time to grow out of childhood. After he left, he developed rapidly.' (Malvernian, Jun 1918). House: No 3, 1911 - 1914. Regiment: East Kent Regt. (The Buffs). Died: 07 July 1916 aged 19 in France. Killed in action at the Somme. Son of Harold and Adele Lea-Smith, of Heathfield Houses, Windmill Rd., Wimbledon Common and Gothic Lodge, Wimbledon Common, S.W. b. 1897. Upper V�Matriculation Class. Minor Scholar. XXII Football. Great War, Private Middlesex Regt. 1914; Lieutenant 6th Bn. The Buffs (East Kent Regiment). 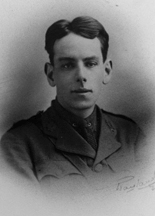 'Full of vigorous life, Leslie Lea-Smith showed great promise in his school days. He was a delightful companion, particularly attractive for his sturdy independence. 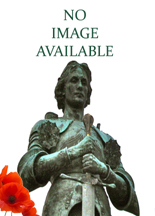 He answered his country's call for the first 100,000 men by enlisting in the Public Schools Battalion (16th Middlesex), where he obtained two stripes. 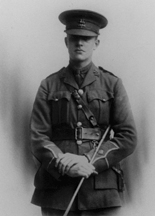 In February, 1915, on his 18th birthday, he received his commission in the "Buffs" (East Kent Regiment). He was wounded in the Hohenzollern crater fighting in March, 1916, and many will recall his graceful figure and imperturbability from the following account which appeared in the "Daily Chronicle": "When all the men in one of these infernal craters were dead or wounded, Lieutenant Lea-Smith ran forward with a Lewis gun, and served it during a fierce attack by German bombers until it jammed. Then he left the gun and took to bombing, and that single figure of his flinging grenades like an overarm bowler kept the enemy at bay until reinforcements reached him." For this act of heroism he was mentioned in despatches. 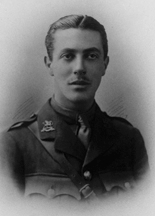 He was killed in action on July 7th, and his Colonel writes: "He was quite the most gallant boy I have known, and his fearlessness almost amounted to recklessness, so great was his utter disregard of danger. His loss to the Battalion is irreparable, and he will be truly mourned by both officers and his men who were devoted to him, as their comfort was always his first thought."' (Malvernian, Jul 1916). House: No 2, 1910 - 1913. Regiment: East Kent Regt. (The Buffs). Died: 01 November 1914 aged 19 in France. Killed in action at Ypres. Born 5th August 1895. Son of Sir Francis Ley, Bt., Epperstone Manor, Notts, and Lady Ley of Lealholm Lodge, Lealholm, Yorks. Upper IV A�Army II. House Prefect. House XI Football. R.M.C. Sandhurst; East Kent Regt. 1914. Attached 1st Bn. Lincolnshire Regiment. 'At the end of September he was gazetted to the Buffs and was with the Reserve Battalion at Dover till Oct. 24th, when in answer to an urgent call he was sent to the front to be attached to the 1st Battalion of the Lincoln Regt. He had been at the front only five days when he fell. The Lincolns had advanced during the night to a position which proved to be extremely precarious, and at daybreak, owing to the enemy's rifle and artillery fire, were forced to retire. A few minutes before the retirement began, he was shot through the heart. So a most promising career has come to an untimely end. He had the makings of a first-rate officer; always energetic, intelligent, and exceptionally smart, he threw himself wholeheartedly into his work. He was one of the best of fellows, and his simplicity of character and cheerful disposition won him many friends. He made his mark at School as an athlete. Though heavily built, he was a fine sprinter and jumper. Few will forget the great struggle in the Sports of 1913 when he lost the Champion Cup by one mark.' (Malvernian, Dec 1914). He was killed at Wystchaete, near Ypres, while endeavouring to assist his wounded men in a retirement. The Maurice Ley Scholarship was founded in his memory. House: Sch, 1900 - 1902. Regiment: East Kent Regt. (The Buffs). Died: 18 March 1917 aged 31 in France. Killed in action. Son of William Milford Norsworthy and Henrietta Threlfall Eve, Yealmpton, Plymouth, b. 1886. Great War, Private Public Schools' Batt. 1914; 2nd Lieutenant The Buffs 1916. Husband of Ernestine Norsworthy (nee Evans), of 14, Trafalgar Studios, Manresa Rd., Chelsea, London. 'Owing to ill-health he left School early and was sent to St. Ives, Cornwall, where he met many artists and took up art. 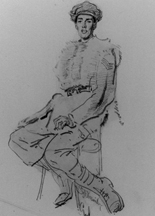 After a short time at Bushey he came under the influence of Mr. Augustus John, Mr. Frank Brangwyn, R.A., and the late Mr. Swan, R.A. During a visit to Liverpool he made many drawings in sepia of the Cathedral while it was in course of construction, a number of them being exhibited in the Walker Art Gallery, Liverpool, and at the various exhibitions in London. A large landscape of his, "The Vista," which showed the good use he had made of four winters passed in Italy, was hung in last year's Royal Academy. 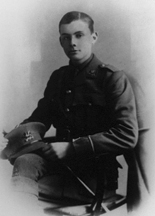 At the outbreak of war he joined the Public Schools Battalion, Royal Fusiliers, and spent the winter of 1915-16 in the trenches, gaining sergeant's stripes. 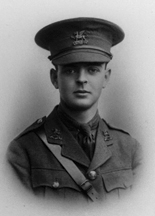 He obtained a commission in the Buffs, and was killed in action four weeks after returning to the front.' (Malvernian, Jun 1917). House: Sch, 1908 - 1911. Regiment: East Kent Regt. (The Buffs). Died: 28 April 1918 aged 26 in Belgium. Died of wounds near Ypres. Son of L . F. and Marie Sitzler, Highbury House, Surbition. b. 1892. Great War, Private, 1st Bn. The Buffs (East Kent Regiment). 'Gustavus Sitzler, the youngest of four brothers who were in School House, was a strange mixture of dreaminess and energy. He had many interests, but no great capacity, and the result was not a great success in school life. But it was impossible not to feel that his intentions were of the best, and not to respect his obvious desire to do right. There are those who will remember the keenness with which he strove to become a successful speaker in the "Debating Society," and to make himself a long-distance runner.' (Malvernian, Jun 1918). House: Sch, 1873 - 1874. Regiment: East Kent Regt. (The Buffs). Died: 13 October 1915 aged 53 in France. Killed in action near Hullock Quarries. Son of Rev. Charles Soames, Rector of Mildenhall, Marlborough, and Lydia Gordon Soames. b. 1862. Raised Corps (Bushmanland Borderers) in Cape Colony during South African War 1901�2 Despatches, Medal, D.S.O. 1902. Great War, Major 6th Bn. The Buffs (East Kent Regiment). 'Trenches. 13.X.15. At 1pm a smoke cloud was created along the line. By about 2pm all the smoke had cleared. At 2.15pm the order was given to charge. The men were met with a terrific fire, machine guns on three sides, while the Germans were lying on their parapets giving rapid fire. The three coys were practically wiped out. Major Soames was one of ten officers killed, along with 400 other ranks.' (Unit War Diary). House: No 9, 1903 - 1909. Regiment: East Kent Regt. (The Buffs). Died: 23 October 1914 aged 23 in Belgium. Killed in action. Son of F. E. Thornhill, Cross Hall Lodge, St. Neots, Hunts, b. 1891. Lower IV�Modern I. House Prefect. Trinity College, Cambridge; B.A. 1913; East Kent Regt. 1912. 1st Bn. The Buffs (East Kent Regiment). Great War, Lieutenant 1914. M.C., Despatches. 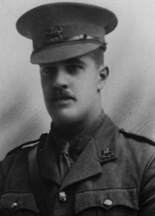 'Robert Thornhill went up to Trinity, Cambridge, and after taking his degree obtained a commission in the East Kent Regiment in 1912. 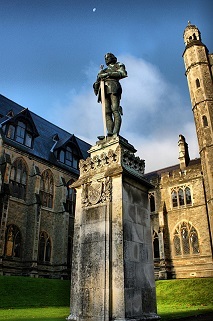 He took part in the early campaigns, was mentioned in Despatches, and was one of the first recipients of the Military Cross. He was reported wounded and Missing in October 1914, and, as nothing further has transpired, he is now presumed to have been killed. He was one of those keen, cheerful boys who contribute so much to the life of a House. He gave of his best at School, as he did afterwards on the battle-field.' (Malvernian, Dec 1919). "On the 23rd October, 1914, Thornhill and his platoon were sent forward to reconnoitre a gap in the line where the enemy had pushed the 2nd York and Lancs out of some trenches. There appeared to be no enemy in the gap and Thornhill and his men rushed forward to secure the trench. 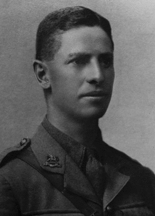 Unfortunately Thornhill and ten of his men were shot down at 15yds range by a hidden machine gun post. Only ten of the party returned unhurt, bringing seven of the wounded with them, but were obliged to leave Thornhill who had actually fallen into the trench and several others." Died: 03 May 1917 aged 22 in France. Killed in action. Son of Charles Carew Warnington and Fanny Warnington, of 4, Camden Park, Tunbridge Wells, and Elmdene, Tunbridge Wells, b. 1895. Lower Shell�Matriculation Class. Shooting VIII 1913,14. Exeter College, Oxford. Great War, 2nd Lieutenant 6th Bn. The Buffs (East Kent Regiment). 1914. 'It was in shooting that Warnington more particularly showed his usefulness, and a steady devotion to it was rewarded by his winning the Average Cup in his last year here. But in those who really knew him�and he was a most approachable boy�there lingers a memory of loyal, unselfish friendship and a fervent wish that he may be among the "missing" who will return. He was reported Missing in May, and is now officially presumed killed on May 3rd.' (Malvernian, Mar 1918). House: No 7, 1912 - 1914. Regiment: East Kent Regt. (The Buffs). Died: 15 September 1916 aged 19 in France. Killed in action at the Somme. Battle: Battle of the Somme. Cemetery: Guillemont Road Cemetery XV. J. 5. Born: December 18th 1897, Mentone, France. Son of Arthur Wellesley-Miller (Chartered Accountant) and Edith Wellesley-Miller (formerly Hamilton), of "Hadley Dene," 24, Bedfordwell Rd., Eastbourne, and Glenlee, Ayrshire. R.M.C. Sandhurst; The Buffs 1915. Great War, 1st Bn. The Buffs (East Kent Regiment). 'Wellesley-Miller did not remain long enough at Malvern to reach any great position, but he remains in our memory as one who worked on quietly and well. He was a very quiet boy, inclined to be shy, and was not originally intended for the Army. When war broke out, like every other Public School Boy, he took the earliest opportunity of getting a commission. He was gazetted to the Buffs in 1915, and went to the front last May. He fell on September 15th, while leading his men to the attack.' (Malvernian, Nov 1916). 'He was my platoon commander; Pte. Edwards in No 5 platoon told me that he saw Mr Miller fall close to him just in front of Loos Wood about 6.30am on the 15th September. I was Prisoners Guard at the time, but made particular enquiries about Mr Miller as we were all very fond of him. There seems no doubt that he was killed.' (Corporal Tritton, 20 General Hospital, Etaples, 27th Sep 1916).